Greece has always been on my MUST VISIT list, so my husband and I didn’t think twice on making it the destination for our honeymoon. 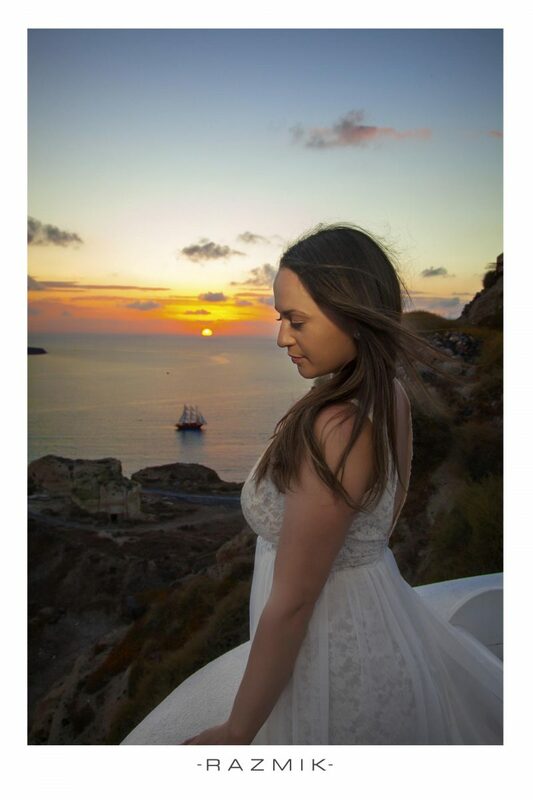 Since we aren’t very traditional, we skipped out on engagement photos and instead decided to do a photoshoot while in Santorini, our first stop in Greece. I use Tripadvisor for all travel related questions before any of my trips, so I posted in one of the forums looking for a photographer but honestly all of the suggestions sent to me just weren’t my style. 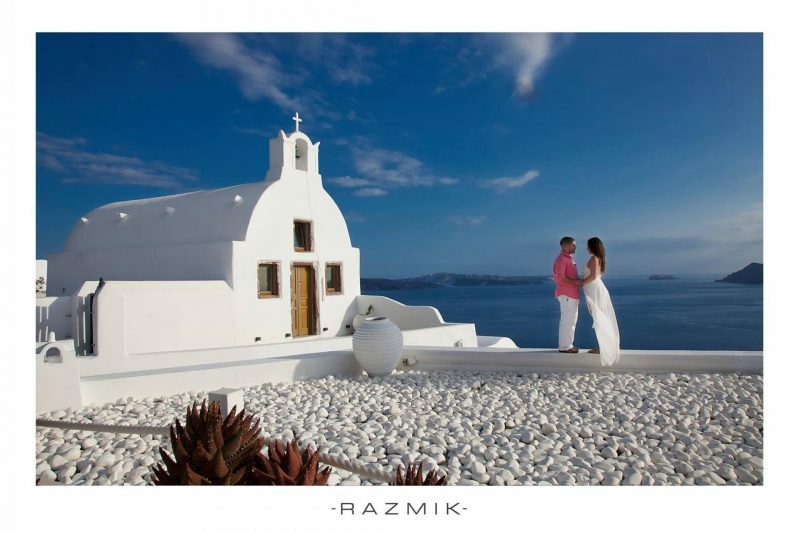 A few weeks before our honeymoon I got a message from a photographer, RAZMIK. He is based out of Lebanon but would be in Santorini, the same time we would be, shooting a wedding. I checked out his website and I booked him right away! 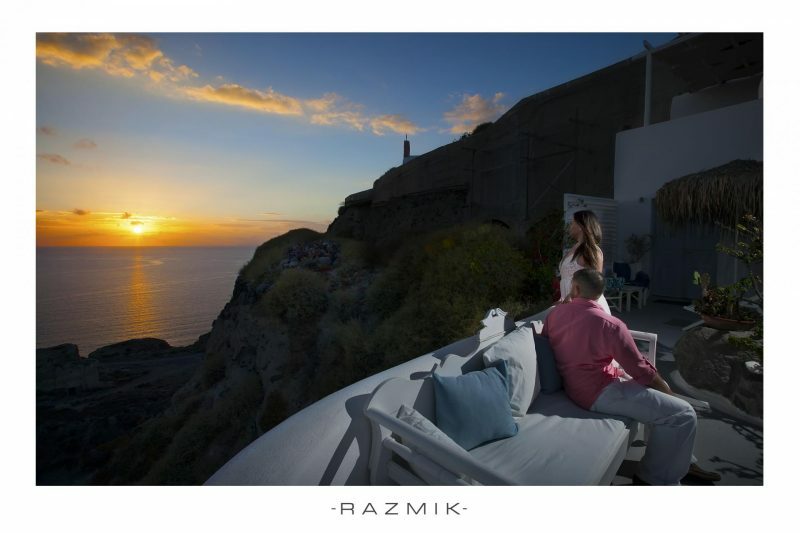 Our day shooting around Oia with Razmik and his wife Rita was nothing short of magical. The photos captured on our honeymoon session are some of my favorite memories. I highly recommend booking a honeymoon shoot if your budget allows, even if it’s only an hour or two. We spent a few hours with Razmik, so we left the creativity and locations up to him but if you are short on time, discuss your vision with your photographer. 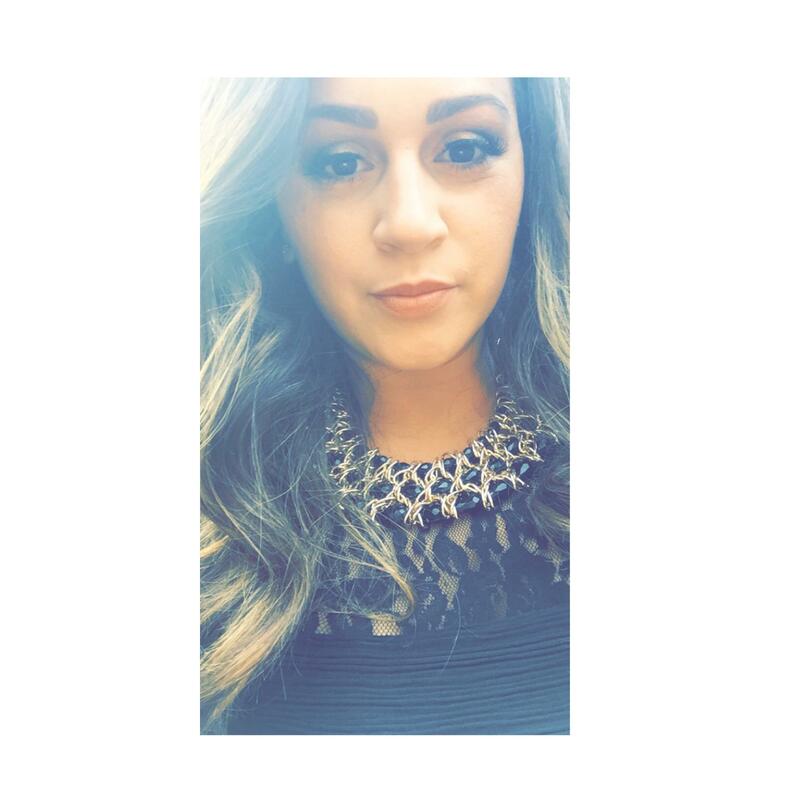 Click HERE to check out RAZMIK’s website. Since he is a traveling photograper he might just be in whatever European city you are visiting. Previous Post 12 Photos That Will Make You Want to Visit Budapest! Next Post Disney outfit inspo for the whole family! 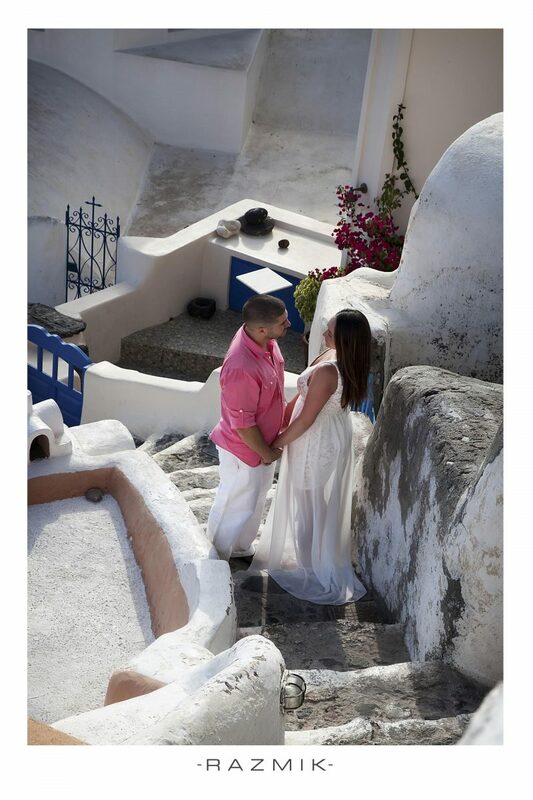 Beautiful couple and beautiful photos… Definitely, a great idea to do a photo in Greece. So…. beautiful!!! Such beautiful photos. Santorini is on my bucket list and I’m determined to get there this year! Thank you! If you do make it to Greece this year, Santorini is a MUST but the smaller islands are magical. Congratulations on the wedding and a beautiful honeymoon! Stunning place. I don’t think you could have picked a more beautiful location! Wow! Have always wanted to go to Santoroni. The houses are so white, sea so blue, that sunset is wow! Lovely pictures capturing your honeymoon perfectly. Thank you. You won’t be disappointed in Santorini. Gorgeous photos! I love the Greek islands but have heard Santorini can be a little overcrowded. Were you able to enjoy it for your honeymoon? Thank you! Yes, we absolutely did. Santorini can be overcrowded but we went right when the high season ended. Oia gets super crowded during sunset but we picked the perfect location and was able to catch the sunset from our patio everyday with no obstruction. We also went to Paros and it was much different. A lot less touristy. Substituting honeymoon photos for engagement photos is such a great idea! The pictures look beautiful and I love that pink shirt against the blue and white. What a beautiful portfolio! I love the idea of substituting engagement photos for honeymoon photos. Getting ready for the wedding can be so stressful and I’d much rather have my pictures taken when I’m relaxed and sublimely happy, rather than busy and crunched for time. I really love your pictures as the sun is setting. Perfect lighting! Wow the pictures are gorgeous and stunning! You are very pretty =] If I ever get married, I would want to go here for my honeymoon! Oh Greece would be such a lovely spot for a honeymoon. Great photos, looks like a very memorable time. What a cool idea, honeymoon shoot! Absolutely beautiful! Santorini is definitely on my bucket list! Great photos! I’ve always wanted to go to Greece. This is such a great idea! I love the thought of having a photographer capturing moments on a honeymoon! Especially in a location like greece! without a doubt this place looks ethereal and perfect for honeymoon destination. Wow that sunset shot at the end is a showstopper! I’m sending this post to my friends who want to go to Santorini on their honeymoon. It’s the perfect inspiration!